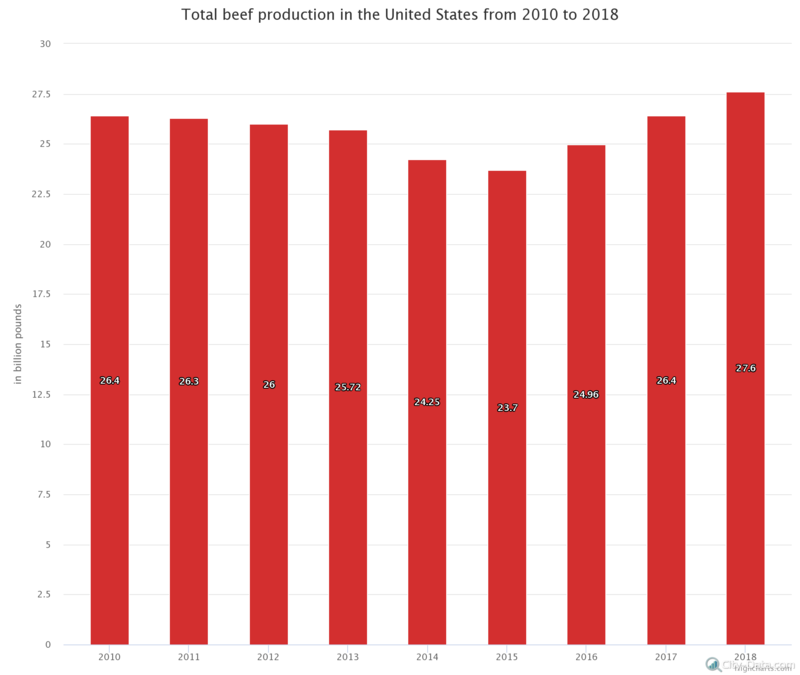 Beef production in the U.S. The United States produces more beef and veal than any other country in the world. The graph below illustrates the country’s total beef production from 2010 to 2017 as well as the forecast for 2018. As you can see, about 26.4 billion pounds of beef were produced in the country in 2010. In 2011, America’s total beef production (including commercial and farm production) amounted to 26.3 billion pounds of beef; the number decreased to 26 billion pounds in 2012. In 2013 and 2014, the United States produced 25.72 billion and 24.25 billion pounds of beef accordingly. The country’s beef production bottomed out in 2015 when only 23.7 billion pounds of beef were produced. In 2016, the country produced approximately 24.96 billion pounds of beef, and production continued to increase through 2017 when 26.4 billion pounds of beef were produced. The forecast predicted that the U.S. would produce approximately 27.6 billion pounds of beef in 2018. In 2015, the main destinations for beef exports from the U.S. included South Korea, Japan and Mexico. In recent years beef retailers in the U.S. have faced major challenges, including rising commodity prices, consumers seeking healthier options (like leaner types of meat) and retailers being forced to start gradually reducing prices. 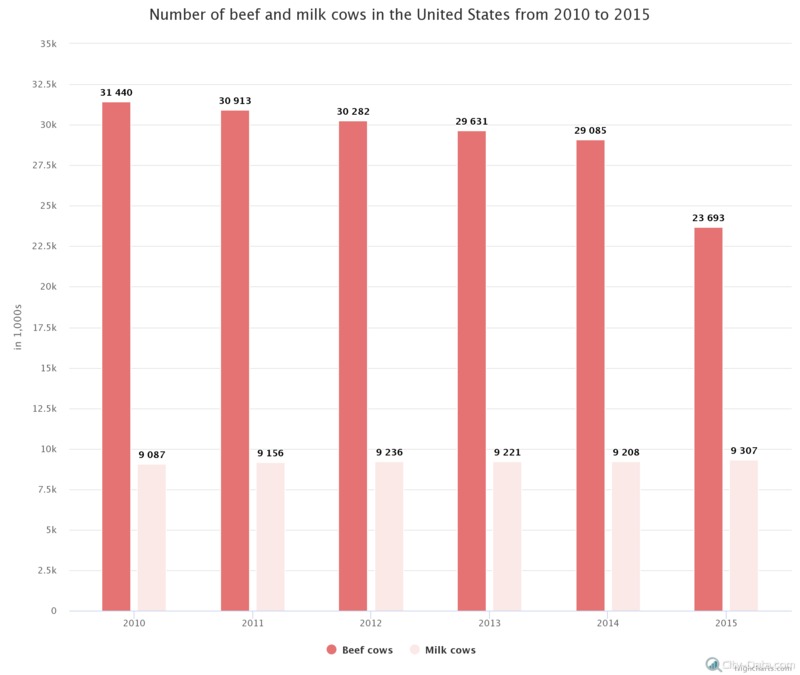 Our next chart shows the total number of beef cattle in the country from 2010 to 2015. In 2010 and 2011, there were about 31,440,000 an 30,913,000 beef cows respectively. In 2012, the number of beef cattle decreased to 30,382,000. This decrease continued through 2013 and 2014, when the country had 29,631,000 and 29,085,000 beef cattle. In 2015, the number dropped even more to approximately 23,693,000 beef cattle. According to a survey conducted in 2015, more than 63 percent of Americans try to include beef and other red meats in their diet.